Why? Why would you name yourself Dirty Habit? As America’s latest epoch of cocktail sophistication enters its 20th year (give or take), it stands to reason that hotels across the country have upped their bar game in order to keep up with the times. Nowhere is that more in evidence than in San Francisco where many hotel bars have had major makeovers in the last few years, and where cocktail consultants are in high demand. Along with the bevy of destination- and date-worthy hotel bars that already dotted the city, this years influx of newcomers (many of which are on this list) clearly means that the term “hotel bar” can’t be used in the derogative ever again. Hotels are where it’s at in this city — sometimes for the cocktails alone, and sometimes just for the view. After a $31 million remodel, Hotel Kabuki now stands as the coolest large hotel outside the Union Square/Nob Hill environs. Its bar, which is now integrated with the lobby with cozy lounge seating, overlooks the revamped Japanese garden courtyard at the center of the hotel, and it’s an airy, welcoming, and modern space full of Douglas fir beams and glass. The drink menu from head bartender Stephanie Wheeler includes over a dozen Japanese whiskeys as well as a trio of “luxury” concoctions made with the finer stuff, like the Tanketsuru ($23, made with Nikka Tantetsuru Pure Malt whiskey, Giffard creme de cassis, and bamboo ash sea salt). Other good options include a trio of two-person tea cocktails, highballs like the mule variation called the Ginger Squared. 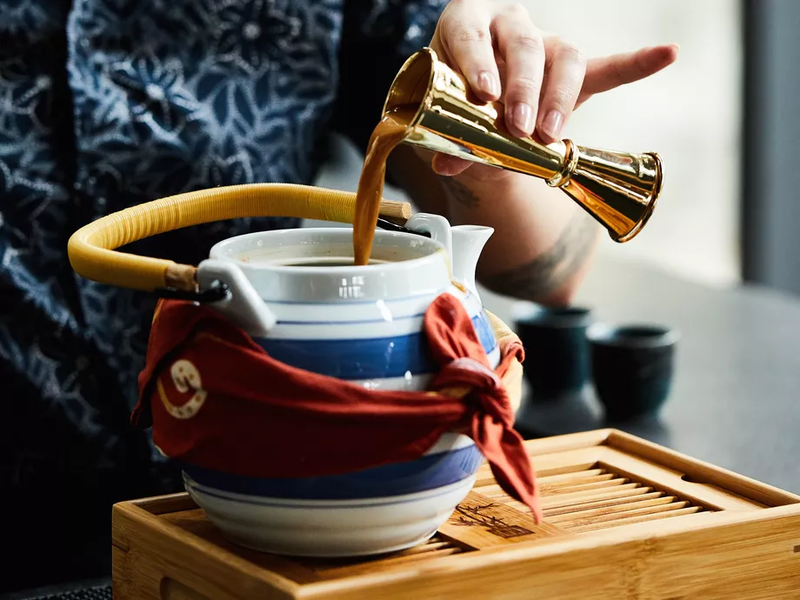 Coming soon will be formal Japanese tea service via a wheeled cart, if you’re not looking for booze before bed. Word has been out for a while now about this rad cocktail den near Union Square inside the Hotel G, but it’s just hidden enough — through an unmarked door and up some stairs — that it’s generally not packed with Trick-Dog-sized crowds on weeknights at least. 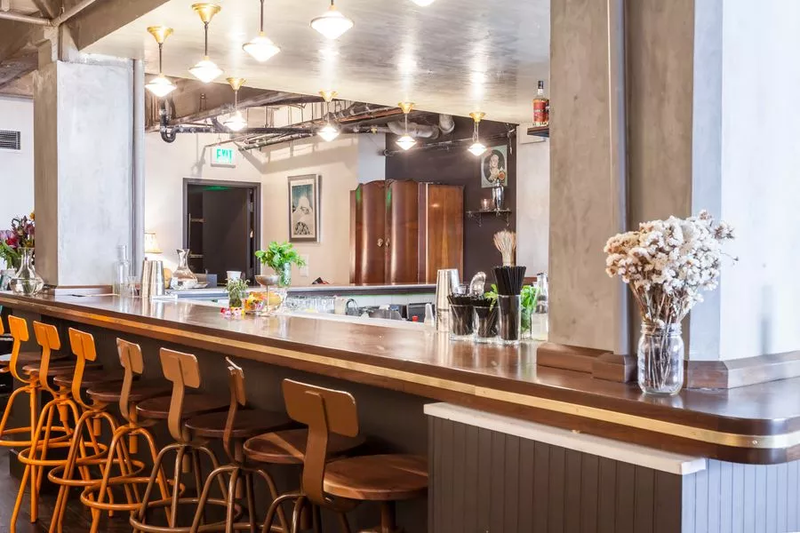 The inventive guys behind it, Brian Felley and Mo Hodges, dreamed up the ambitious, but tiny, bar Big a few years ago, and now they’ve got two Union Square hotel bars under their belt, with the Douglas Room a couple blocks away. Benjamin Cooper is staffed with a gang of seasoned pros who change out the menu about once a week, and there’s always something whimsical, layered in flavor, and well balanced to try. Also, this is one of those places where you absolutely should let the bartenders get creative with a bespoke cocktail that best fits your mood and spirit preference, if nothing on the menu grabs you. Big 4’s seeming remoteness and its cloistered, mid-20th-century vibe is complete with ice-cold martinis and the occasional piano man tickling the keys. It’s a place that feels comfortably out of step with most of the hotel bars on this list, owning its old-school charms and not trying to get too complicated with the cocktail selection. It’s a place for snifters of Cognac or perfect Manhattans, and that’s as it should be — especially given that the name “Big 4” refers to the big four money men of San Francisco’s early days, railroad magnates C. P. Huntington, Charles Crocker, Mark Hopkins, and Leland Stanford, whom you could easily picture smoking cigars here. And if you’re lucky on a cold night, there might even be a fire burning in the fireplace. The only bar/restaurant on this list to be a semi-finalist for a James Beard Award for Best New Restaurant, The Cavalier is the British-inspired tavern from the talented team behind Marlowe, Park Tavern, and Leo’s Oyster Bar, attached to the Hotel Zetta (which also has a small and less exciting lobby bar next door). 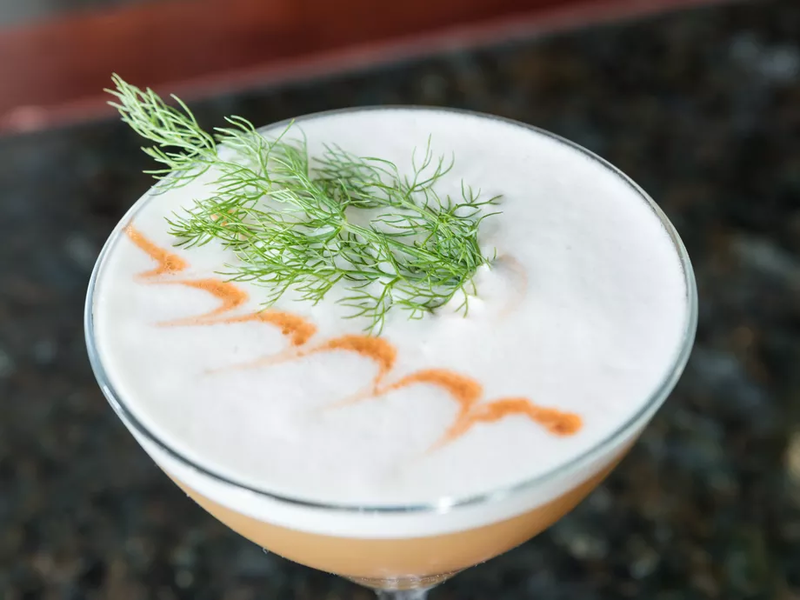 Bartenders here do a top-notch job with English classics like the Vesper and the Pimm’s Cup, and the bar bites are great too — don’t miss the Scotched duck egg, the lamb scrumpets, and the hen egg hollandaise with ham-and-cheese soldiers, for dipping. And these days you can also sometimes find weekend parties open to the public in the attached back-room space called Marianne’s, which has its own small bar and alleyway entrance. Styled on a rock-and-roll theme, as a number of hip boutique hotels are these days, Chambers is bedecked with many shelves of vintage LPs, Chambers Eat + Drink at the Phoenix Hotel. The cozy space is divided into a bar and lounge on one side where snacks can be ordered (and the Instagrammable words “Be Amazing” are written in lights behind the bar), and a more restaurant-focused side with its own bar, and several booths that make great venues for catching up with old friends, or quiet dates. Don’t be fooled by the blunt simplicity of the cocktail menu, with drink names like “Rum Drink,” “Gin Drink,” and “Classic Drink #2” — these are all, in fact, well imagined and delicious concoctions. 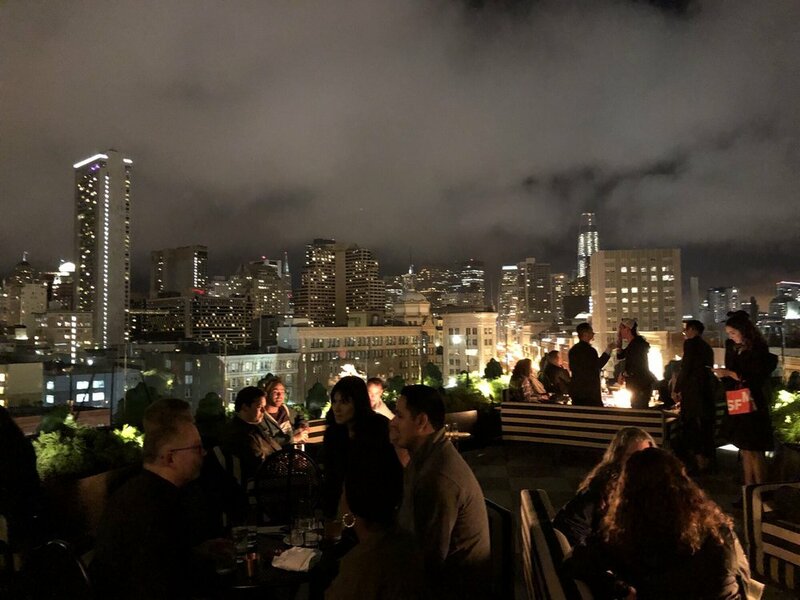 If you want to visit the side of New San Francisco that feels most like LA, head over to Charmaine’s any night of the week, but be prepared to wait in line. A gorgeous design by (LA-based) designer Kelly Wearstler and a one-of-a-kind view overlooking mid-Market Street and the Federal Building are offset by a dash of pretension usually reserved for sceney LA bars. The crowd is a mix of tech workers and bougie tourists from all over staying at the Proper Hotel downstairs, and the many fire pits are sure to be a big draw come Fogust. All told, it’s a must-visit spot for the view and the couches alone, especially right when it opens around 3 p.m., but otherwise lines for the elevator can stretch well past the half hour mark. Just off the lobby in the Westin St. Francis is Clock Bar, now a decade old after being one of the first hotel bars in the city to up its mixology game and become a draw for local cocktail hounds. They’re still serving some of the drinks the place became known for like the Chartreuse Swizzle (green chartreuse, pineapple, lime, falernum, nutmeg) and the Absinthe Makes the Heart Grow Fonder (Tanqueray gin, Lillet, Aperol, absinthe). They do rotating theme menus as well, like the current one with drinks inspired by SF-set movies. The low-ceilinged, mid-century vibe of this den-like hideout is enough to warm you on a chilly SF evening, and while it can get crowded in here with hotel guests, it’s a good little secret to have in your back pocket when seeking out a top-notch cocktail, right on Union Square. Despite it’s puzzling name choice, Dirty Habit sets itself apart as one of the more sophisticated and cool hotel bars in town. Tucked up on the fifth floor of the Hotel Zelos, in the space that was home for many years to the fine-dining spot Fifth Floor, Dirty Habit boasts a warm and inviting, low-ceilinged bar and lounge perfect for foggy-night drinks, as well as a bright and airy patio in the interior courtyard which makes for an excellent warm-weather happy hour destination. The food is excellent, but the six-page cocktail menu is clearly the focus here, with punch options for groups, a selection of fun boilermakers, and over a dozen new and classic cocktail options — the latter under the header “Old Habits.” Go for the Giggle Water (Berheim Wheat Whiskey, Averna, spiced pecan syrup, and lemon) or the vegetal and amusingly named Squashin’ Feelings (gin, delicata squash, Lustau Amontillado sherry, lemon, and sage). On the one hand, the Douglas Room at the revamped Tilden Hotel is hipper than your average hotel bar — they serve tater tots, and the drinks are by the Benjamin Cooper crew. On the other hand, it’s really more like a narrow neighborhood bar with a high tourist quotient. The drink selection one year in isn’t nearly as big or interesting as Benjamin Cooper’s around the corner, and it’s best described as an unpretentious and welcoming spot to duck into if you find yourself on this dicey stretch of Taylor and in need of an above-average boozy pick-me-up. 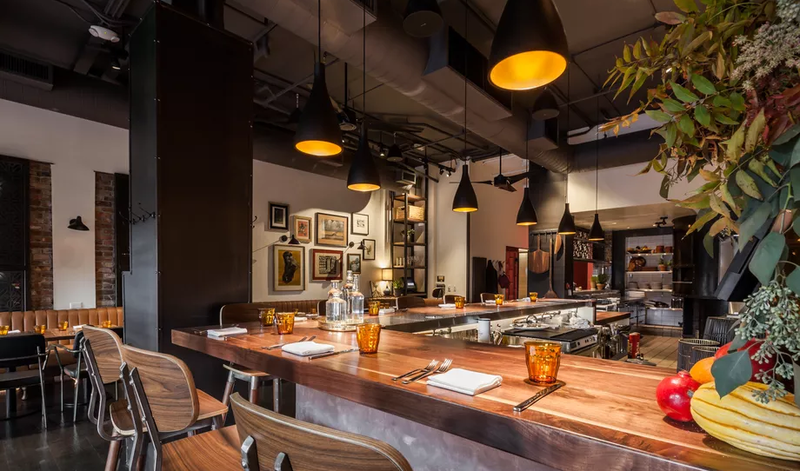 This stylish, Art Deco-styled new addition to the mid-Market/Tenderloin bar scene, inside the Hotel Bijou, takes its name from the classic Martini variation with a pickled onion in it in place of an olive. It’s appropriate then that the cocktail menu begins with a trio of Gibsons, including the delicious and savory Garden version, with French oak-aged green peppercorn gin, sage vermouth, and a pickled cucumber for garnish. With all the gold and mirror accents in the room and behind the bar, and the over-the-top muraled ceiling, Gibson feels like a special, out-of-the-way spot despite the street circus outside — you or your date might rather go directly out the door into a waiting car than linger too long at the corner of Mason and Eddy. 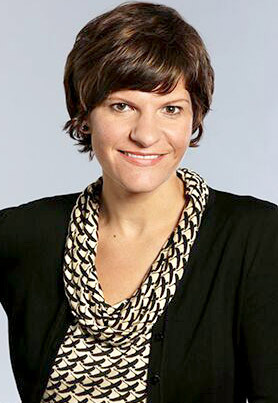 Thanks to a makeover just a few years back at the hands of architecture firm Cass Calder Smith, the mezzanine bar at the Grand Hyatt, called OneUp, is a sleek and modern space in which to grab a drink, with a grand, window-backed bar overlooking Sutter Street. Make a grand entrance up a staircase, then via a long bridge that connects it with the dining room; with cocktail consultation from the likes of Meadowood’s Scott Beattie, you’re bound to be a little impressed. The options include classics like a Manhattan or Southside (gin, lemon, mint), or original, fruity concoctions like the Purple Hayes (citrus-infused Selva Rey rum, blackberry, Grand Combier, lime, and mint). Walking into the Ritz-Carlton, situated just at the edge of Nob Hill and above Union Square, automatically makes you feel like a baller. The marble-lined lobby and dark gray lobby bar with its rectangular chandelier are luxe and moody spaces, and then further inside the building is Parallel 37, the hotel’s restaurant with a bar up front. The lobby bar demands a stiff drink like a scotch on the rocks or a Manhattan, but in Parallel 37 there are fruitier mixed concoctions (some of them good) like the Stonecutter (Bulleit bourbon infused with orange jasmine, Lillet, Dimmi, lemon, mezcal), and an internationally inspired menu that sticks to basics with some seasonal California twists. The Viceroy Group’s makeover of the Hotel Zeppelin came with a rock-and-roll/Summer of Love-themed basement rec room as well as a cool lobby bar, and another pair of bars inside Rambler, the hotel’s full-service restaurant. The food here is quite good, but if you’re just sticking to drinks, they have a great booze selection with a large array of tequilas and whiskeys, and some solid, uncomplicated house drinks as well, like a citrus-infused Sazerac, and a gin Martini with cucumber bitters. It’s a fresh and unchallenging hotel bar experience that feels like a happy refuge from Union Square, and a bit like someone’s well-appointed den, complete with a handsome, polished wood, wrap-around bar where you could easily waste a few hours. Sure it’s a bit of a tourist and wedding reception trap. And sure, you’re likely to encounter more conventioneers here than you are locals in the know. But that doesn’t mean the Starlight Room, atop the Sir Francis Drake Hotel, isn’t an excellent place for a first or second date, or just a surprise side-trip while shopping with friends in Union Square. It’s one of just a few top-story bars left, and the view can not be beat — unlike the much stuffier Top of the Mark, you won’t be forced to sit at a table, though that option exists. The main bar is small, and could be crowded depending on the night, but assuming getting your drink isn’t too much of a hassle, make your way over to the dance floor at the far end of the space, with wall-to-wall windows overlooking downtown and the Square, and little sparkling “starlights” embedded in the floor. Just like that, you’ve found one of the A+ sunset-watching spots in the city. The lobby bar at the St. Regis may not have quite the sheen of newness it had shortly after opening in the last decade, and it is now swarmed with conventioneers and tech execs most evenings given its proximity to the Moscone Center and SoMa. But it is still a sleek space with a long, modern, gas-flame fire feature at one side, and plush nooks for drinking in small groups, should you be there early or late enough to snag one. The menu has a handful of good house cocktails (all $16.50), like the Getaway (Hophead vodka, Averna, orgeat, lemon, elderflower), as well as a spicy house Bloody Mary, dubbed the Red Snapper because, as at least one legend goes, the drink was invented at the St. Regis in New York under that name (though that, like most cocktail history, is disputed). The bar bites menu includes an excellent, if expensive, burger topped with Petaluma Wagon Wheel cheese and tarragon aioli ($22). 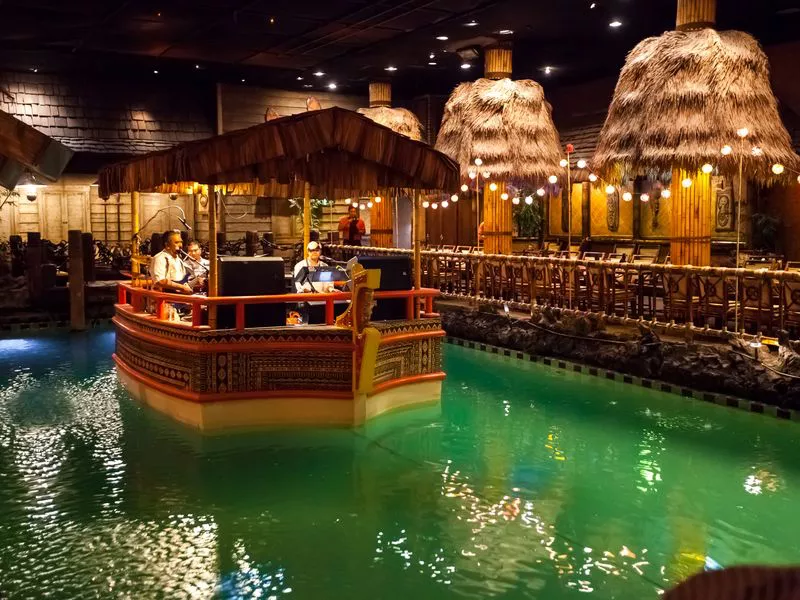 No list of SF’s hotel bars would be complete without the vintage Tiki masterpiece that is the Tonga Room, lurking in the depths of the Fairmont Hotel. It’s been preserved in almost all its original pseudo-Polynesian details, as originally designed by MGM set designer Mel Melvin back in 1945. Nautical roping, palm frond huts, and kitsch galore fill the space, at the center of which is a pool of water where it “rains” with thunder and lightning every half hour, and where a live band floats on a raft several nights a week. The Tiki drinks, while better than they used to be thanks to the re-introduction of fresh juices during a menu revamp five years ago, are still overly sweet and nowhere near the standard-bearers being served at Smuggler’s Cove. But stick to Mai Tais and Singapore Slings and you can’t go too wrong, or just order a gin and tonic and wait for the next tropical storm to pass through. The grandaddy of SF’s top-floor tourist magnets, Top of the Mark at the Intercontinental Mark Hopkins, manages to still be a thing in the 21st Century because the 360-degree view is impossible to beat. Yes, you may be made to sit at a table and the Martini menu is not recommended (it’s basically unchanged since the 90s). And no, you’re not going to find any wild bartender talent behind the bar because they’ve kept the formula pretty simple here. Wander in for a drink on a weekend afternoon, and it should be pretty mellow and easy to snag a prime view spot. Fun fact: There’s a bottle of whiskey kept in a case by the elevator that members of the armed services have been taking nips from (and periodically replacing) since WWII, and signing the log book when they do. Two-year-old Tratto hasn’t made big waves food-wise in the Union Square area, but its handsome, big-windowed bar at the Marker Hotel is nonetheless a pleasant option for pre- and post-show cocktails, or drinks with a friend in town who’s staying nearby. The drink menu has been pared down since the place opened, and now just has a handful of options like a Negroni flip (a Negroni with an egg-white froth), a margarita with Campari and grapefruit, and an Italian-style Manhattan variation on tap called the Castra Nicia (Jim Beam rye, sweet vermouth, maraschino, and Averna). And, differentiating the space from its former incarnations are some cool line-drawing murals by local artist Amos Goldbaum. The View is supremely dated, and doesn’t offer anything special, drinks-wise, but that is not the point. The lounge areas inside the top floor of the jukebox-topped Marriott offer uniquely stunning sunset and nighttime views of San Francisco and all its hills, bridges, and freeways. It’s too gorgeous of a vantage point to be reserved for tourists alone, made more unique because the windows are as tall as they are wide. If you can, go when they open at 4:30 p.m. — just as at the Starlight Room and the Top of the Mark, you’ll be competing with a lot of hotel guests and other tourists for the available window seats — order something simple, pay more for it than you think you should, and spend an hour or two just watching the light change over the Bay Bridge, or Sutro Tower.